I Live in Brisbane and Love this city. I have traveled the world and seen some fantastic cities, but I always want to come home too Brisbane. Last night my wife and I headed down to the Kallangur Tavern for our weekly game of poker. We decided that we would have dinner there. The menu is pretty good. Has a good variety to choose from. But tonight I decided on the Pork spare ribs. Dannii went with the soup of the day and the Calamari. I have eaten some of the best ribs in the world in the US, and wasn't sure how these would stack up. To my surprise they were good. 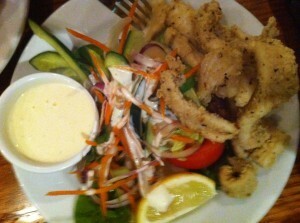 They were served with a salad with a nice dressing and chips. Still a long way to go to be the best, but they were definitely enjoyable. Danni's soup she said was nice and the Calamari was great. 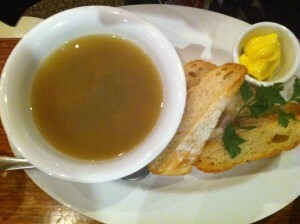 The Soup was served with toasted bread, the Calamari was served with a salad and a nice dipping sauce. For further information on the Kallangur Tavern, please see here. 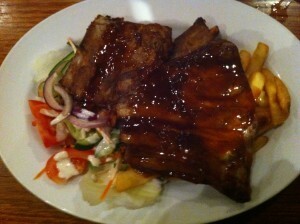 The Ribs are fantastic at KTs. For a Pub the food is great. Is Poker a regular event here? What Poker League is it? The National Pub Poker League run a free tournament every Tuesday night. you can register from 6:00pm with start time at 7:00pm. Hope to see you there.